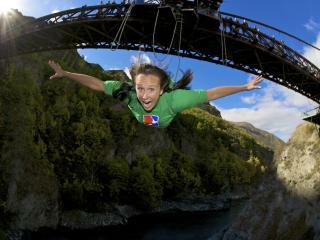 The world's bungy jumping capital, New Zealand offers a number of famous jump sites including the AJ Hackett Bungy, Hanmer Springs, Rotorua, Taupo, the Harbour Bridge, Sky Tower and 5 sites in Queenstown. 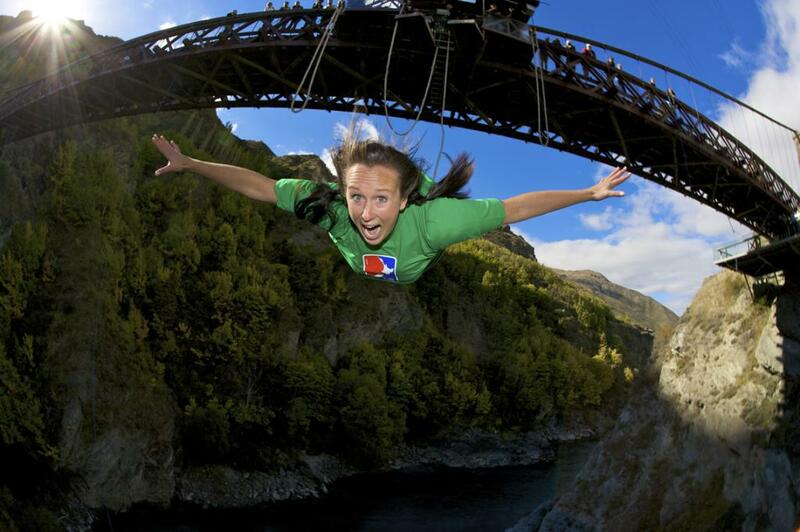 Auckland and Queenstown are also home to a Bungy Rocket. A land of rivers, lakes, beaches and streams, canoeing and kayaking are a popular way to explore New Zealand, especially the Hauraki Gulf, Bay of Islands, Abel Tasman National Park, Fiordland and Marlborough Sound. 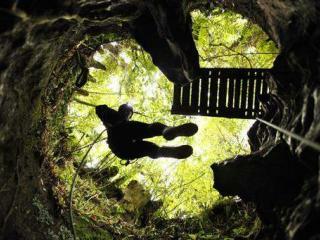 Home to some of the world's most challenging caving systems, New Zealand is famous for the Waitomo Caves, Tasman Mountain and Harwoods Hole on Marble Mountain's Takaka Hill. Explore glow worm caves, limestone formations, blackwater rafting and some of deepest and largest caving systems as well as one of the largest sinkholes in the world. The Southern Alps offer alpine climbing adventures including Westland, Mount Aspiring, Fiordland National Park, Arthur's Pass and Mount Cook, one of Australasia's highest peaks. 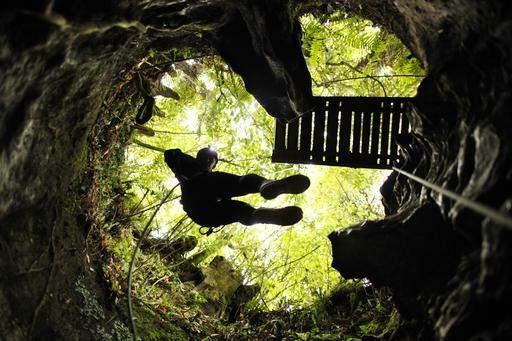 Abseiling is available on both sea cliffs and mountains including Waitomo and the water chutes, sculptured rocks and cascading waterfalls of Haggis Honking Holes. Cycling is a pleasant and easy way to navigate New Zealand's cities and towns, particularly with its year round mild climate. However the rugged mountain terrain also offers excellent adventure opportunities with tracks specially designed for mountain bikes plus single and 4WD tracks through the native bush. New Zealand's 18,000km indented coastline is studded with world class dive sites with easy offshore access including Bay of Islands, Stewart Island, Fiordland and the Poor Knights Islands Marine Reserve, ranked in the top five dive sites in the world by Jacques Cousteau. 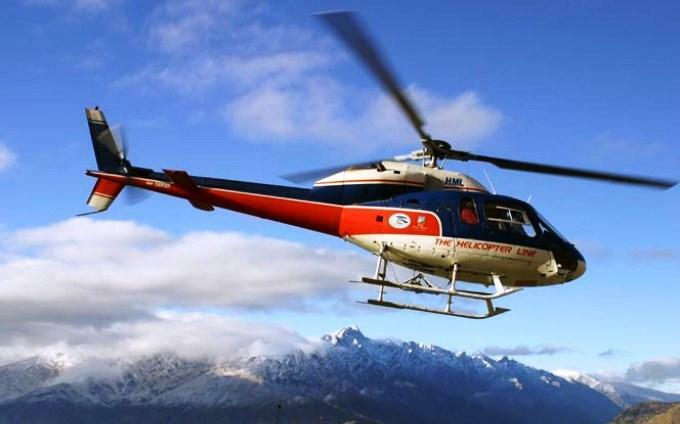 The fastest adventure ride in the world, the Fly By Wire was invented in New Zealand and allows you to pilot your own high speed craft connected to an overhead suspension wire. The six minute flight allows you to steer, control your speed and fly as fast and as high as you like in any direction. Fly By Wire is available in Queenstown and Wellington. See New Zealand's spectacular scenery from above with 23 gliding clubs throughout the country offering powerless flight with qualified instructors or combine the excitement of parachuting and hang gliding with parapenting. 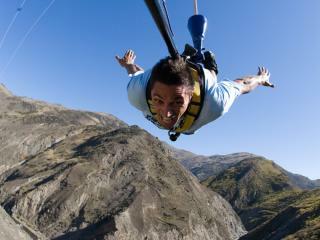 Instruction and tandem flights are available with Queenstown being the most popular location. Operators throughout New Zealand offer half and full day as well as extended treks through scrublands, forests, farms, beaches and high country as well as volcanic plateaus, Pakiri, tussock grasslands and Otago's old mining settlements. Experience the romance of New Zealand with a hot air balloon flight over the colourful patchwork of the islands. 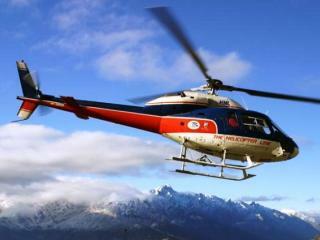 There are 6 locations throughout the country including Auckland, the Southern Alps and Christchurch. To help keep populations in check, guided hunting expeditions are available throughout the country and target introduced species such as goats, tahr, wallabies, pigs, chamois and red, fallow and sika deer. 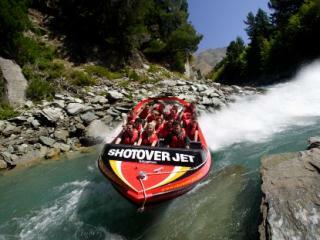 Power through sheer rock faces, water channels and narrow river gorges aboard the excitement of a jet boat. Some of the most popular trips are available from Canterbury, Queenstown, Makarora, Buller, Rangitaiki, the Waikato River and Whanganui River. 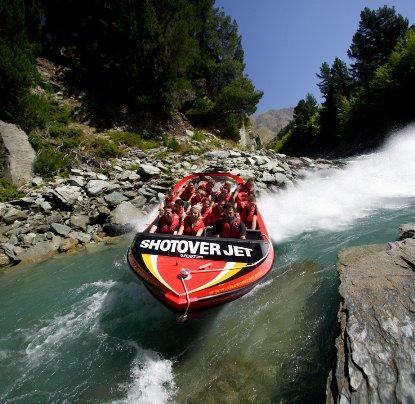 White water rafting is a popular adventure activity in New Zealand with rapids ranging from a tranquil Grade 1 to the extreme adventure of Grade 5. 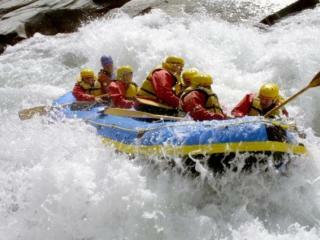 Guided trips last anywhere from a few hours to 5 days and are conducted by qualified guides. All gear is provided and some of the most popular spots include the Bay of Plenty, Hawkes Bay and Queenstown. 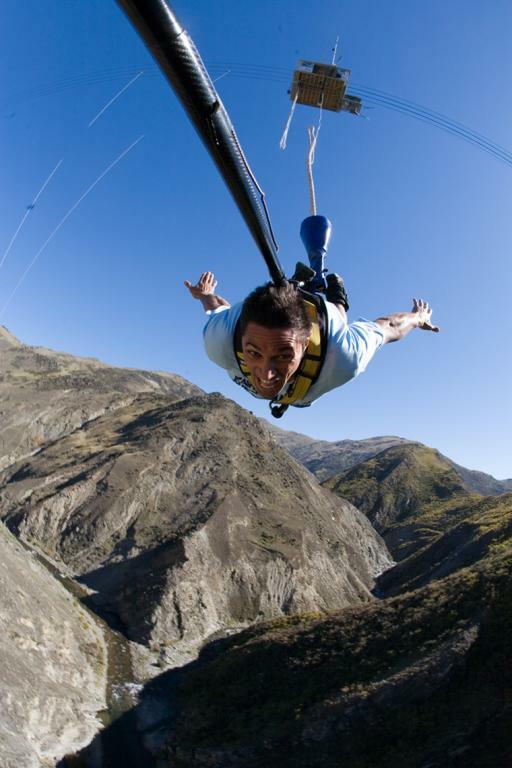 Solo or tandem jumps are available in Auckland, Christchurch, Rotorua, Queenstown, Taupo, Wanaka and Hastings with no experience required and only the desire to see the beautiful countryside of New Zealand from an adrenaline pumping new perspective. New Zealand is home to 12 commercial ski regions, 12 club fields, 1 Nordic cross-country area and a number of heli-skiing operators. Some of the country's largest ski fields are located in Mount Ruapehu, Queenstown, Wanaka and Mount Hutt. Invented in New Zealand, the unique activity of zorbing is fun for the whole family, is very safe and doesn't require too much fitness or a sense of adventure. Strapped into a large plastic inflated sphere, the 'zorb', you're rolled down a hill where you can reach speeds up to 50kmph, rotating inside the rotating sphere. Rotorua and the Bay of Islands both offer Zorbing.